Nagahama WZN Special is a 5% German hefeweizen from Nagahama Roman Beer, based in Nagahama, Shiga prefecture. It’s part of their all-year round line up of beer and was first on sale in June 2016, following on from their Nagahama IPA Special. Nagahama WZN Special is brewed using imported German wheat and malt and is brewed to a Southern Germany style recipe. WZN? Drp th vwls shll nw. I thought about dropping all the vowels from this review of Nagahama WZN Special, but the last time I suggested doing something about mucking around with a language, Joe was not best pleased to support the idea. I did think that it would save on the file size of this review on the server but again, shot down. I thought it would also make the review faster for people to read as well but then grammatical complexity would be a problem for some as well. Anyway, diversion aside, Nagahama WZN Special poured out a deep golden orange colour with a large amount of light frothy airy head on top. It had a fairly potent aroma of bananas but the distinctive peppery / clove aroma was lacking. I guess the fermentation had been a bit on the high side, thus losing that aroma. There was also a distinct citrus aroma to the beer as well, though there didn’t seem to be any note of what hops Nagahama Roman Beer had used in the brewing process. The banana flavour was the most potent flavour in Nagahama WZN Special, though there was thankfully some semblance of a peppery kick in the body as well. However, the wheat flavours I was expecting never materialised and ended up being more of a sweet, banana weizen that felt it was lacking something. It finished off a tad sweet, especially when it had warmed up to room temperature as well. 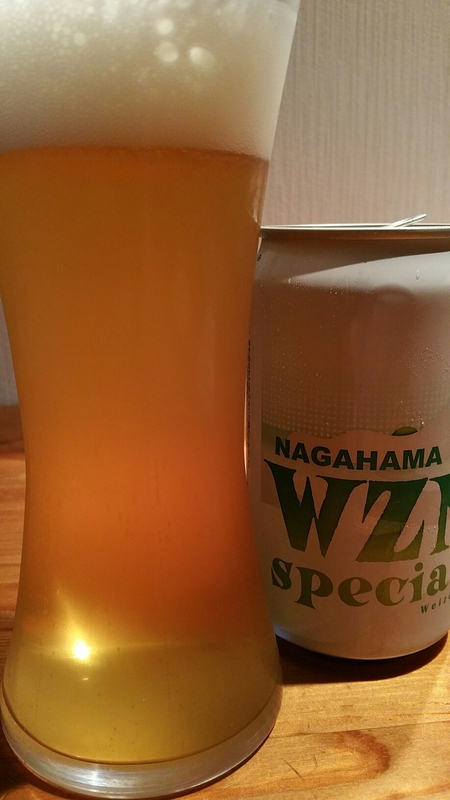 Nagahama WZN Special isn’t a stand out weizen and in the end, it felt cloying. When I saw this, I was a bit perplexed by the WZN, but after spotting the IPA next to it, I figured out that WZN is weizen. 3-letter-words like IPA are now the design standard? So, maybe the next thing we see is a PLS (pilsner, please) or BCK (a black or a bock, or a black bock?). I drank Nagahama’s Ibuki-weizen a year or two ago (sold in a bottle), and liked it very much. This “special” weizen, which I got last week, is not so special, I agree with Rob’s review. However, at 298 yen (Seijo Ishii price, plus tax) it is an excellent value for money. Probably one of the cheapest weizens available, and therefore I will buy it again. Thanks for the comment. The IPA had sold out in the shop I got my can from but as you said, makes sense. It’s about the same price as the Coedo Shiro and both of them are good value for money. Here’s hoping that the next one is a bit easier to decipher from the can.